Robust indoor positioning at sub-meter accuracy typically requires highly accurate radio channel measurements to extract precise time-of-flight measurements. Emerging UWB transponders like the DecaWave DW1000 chip offer to estimate channel impulse responses with a reasonably high bandwidth, yielding a ranging precision below 10 cm. The competitive pricing of these chips allows scientists and engineers for the first time to exploit the benefits of UWB for indoor positioning without the need for a massive investment into experimental equipment. 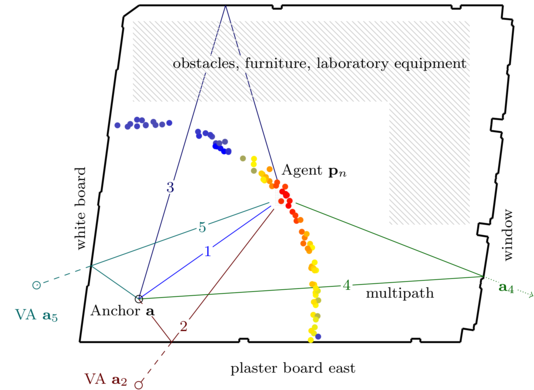 The figure illustrates the employment of multipaths (numbers 1-5) to estimate the agent's position using a single channel-impulse-response measurement only. The colored dots represent the evaluated likelihood where brighter indicates a better model fit regarding the observation. More information can be found in the paper and here.